This article was first posted at PROSPECT BLOG. 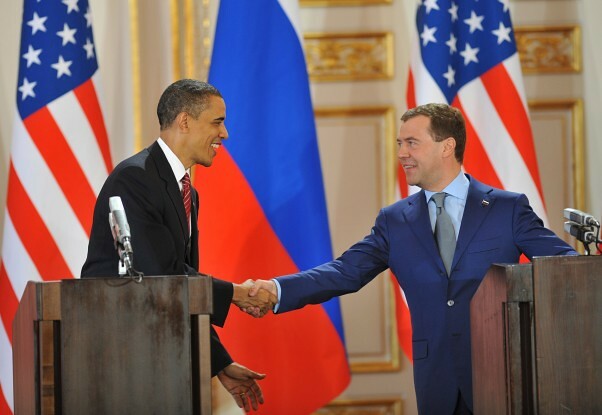 In April 2010 Barack Obama and Russian President Dmitry Medvedev signed the New START nuclear arms control treaty. The treaty, ratified and entered into force this past February, reduced both countries’ levels of deployed nuclear weapons to numbers not seen since the 1950s. However, American support for the treaty was not universal – despite endorsements by George H.W. Bush and six former Republican Secretaries of State, conservative lawmakers and pundits alike rushed to attack New START as a threat to US security and appeasement to a resurgent Russia. Republican presidential candidate Mitt Romney was especially critical of the accord, claiming in a Washington Post op-ed that “the Obama administration has been badly out-negotiated” and that the treaty could be President Obama’s “worst foreign policy mistake yet.” Despite this strident opposition the New START treaty was ratified, ushering in a new era in strategic arms limitations. The ratification of the New START agreement was a victory for nuclear arms control advocates. It should not, however, be the end of efforts to reduce stockpiles of nuclear arms: in addition to the 1,550 deployed strategic nuclear warhead limit mandated by New START, both Russia and the US currently stockpile thousands of tactical nuclear warheads – weapons designed for attacking military targets not covered by New START — and maintain thousands more warheads in storage. Other nuclear powers field hundreds of their own warheads. Though the threat of nuclear war has declined since the end of the Cold War, as long as large numbers of nuclear missiles remain armed the threat of an accident or misunderstanding escalating into a nuclear exchange that ends human civilization remains. The United States should continue to reduce its nuclear arsenal. Nuclear disarmament has long been a goal of progressives around the world. However, their efforts are often hampered by an unwillingness to recognize the deep structural incentives that encourage the preservation of the nuclear status quo. Anti-nuclear activists are too often unwilling to offer any detailed arguments about which specific weapons systems should be cut, and often seem to feel that by recognizing that nuclear weapons have some degree of strategic value compromises their deep moral opposition to their existence. This is unfortunate – if anti-weapons activists are unable or unwilling to offer detailed arguments in favor of specific arms control proposals, their laudable mission won’t be successful. Progressives in the US and Russia must continue to argue for further bilateral arms control treaties that reduce both countries’ number of nuclear weapons. However, the United States should also take the revolutionary step of eliminating intercontinental ballistic missiles, a nuclear delivery system that plays a key role in America’s nuclear force. Though we should encourage Russia to do the same, US lawmakers should be prepared to make these unprecedented cuts unilaterally. This is a rational strategy that would increase global security, lower US defense costs and dramatically improve international perceptions of the US, all while not compromising American safety. The end of the Cold War is an enormous opportunity to defuse what’s still the greatest threat to human civilization. We shouldn’t let fear prevent us from taking it. Both the US and Russian nuclear arsenals are split between three distinct delivery systems in an arrangement termed the ‘nuclear triad’. At the dawn of the nuclear age, the only vehicles available to deliver nuclear bombs into enemy territory were large aircraft. As tensions between the USSR and its onetime Western allies began to escalate in the aftermath of World War II, the USSR, US and UK all invested in large fleets of intercontinental range strategic bomber aircraft capable of penetrating deep into enemy airspace in the event of a nuclear war. However, by late 1950s advances in surface-to-air missiles made it increasingly apparent that bomber aircraft would have difficulty surviving long enough to deliver their nuclear payloads. While this revelation led to the development of more technologically advanced and survivable strategic bomber aircraft and autonomous nuclear cruise missiles that enabled strategic bombers to hang back from heavily defensed targets, it also encouraged the US and USSR to develop missiles with intercontinental ranges able to carry nuclear warheads across the planet in minutes. These ICBMs – intercontinental ballistic missiles – heralded a revolutionary shift in the Cold War calculus of nuclear destruction. Unlike relatively slow bomber aircraft, a mass exchange of ICMBs kill a significant portion of humanity in minutes, and apart from the wild-eyed, technologically infeasible missile defense schemes of the 1980s ICBMs defied all hope of being intercepted or destroyed before they reached their targets. Paradoxically, the almost incomprehensible destructive power of these new weapons stabilized tensions between the USSR and US, and likely prevented the Cold War from escalating into World War III. Because it was unlikely that any side could prevent an opponent’s ICBMs from reaching their targets both adversaries knew that any war would be unwinnable, removing any incentive for a preemptive strike. However, the first generation of ICBMs were not entirely effective. Early ICBMs were large and delicate, limitations that forced them to be stored in fixed silos, meaning that both the Americans and Russians knew the exact locations of their adversary’s missiles. In the early years of the Cold War this was not a fatal deficiency, because early ICBMs were not accurate enough to target enemy missiles. However, rapid advances in ICBM guidance systems soon made targeting and destroying enemy missiles on the ground a realistic possibility. Both the US and USSR assigned large numbers of their ICBMs to the counterforce mission – destroying enemy nuclear forces and their command and control infrastructure – rather than the more traditional countervalue mission – destroying an enemy’s cities. A country capable of destroying the bulk of its opponent’s nuclear weapons on the ground possessed what was referred to as ‘first strike capability’: the ability to launch a surprise attack without suffering retaliation. The advent of counterforce capabilities was destabilizing because it created a tempting incentive for a preemptive strike – because the side that launched their missiles first in a crisis had the advantage, both sides had an incentive to escalate any crisis to Armageddon. Because the flight time of these missiles is measured in minutes, by the time one side detected the enemy’s missiles launching they would have only minutes before their own missiles were destroyed on the ground. In a crisis this meant that both sides had the incentive to strike first, rather than risk their enemy making the decisive first move. Though the advent of counterforce capabilities did destabilize the Cold War, it also introduced the possibility of limited nuclear war. While early nuclear war planners had assumed that any nuclear war would immediately escalate to targeting cities, a purely counterforce exchange would spare population centers, dramatically lowering casualties and potentially allowing for human civilization to survive a nuclear war. However, it’s worth remembering that even a pure counterforce strike would be unimaginably destructive: a US strike against a single group of Chinese ICBM silos would cause upwards of 20 million casualties . A less restricted counterforce exchange – for example, one between the US and Russia – could kill millions more. The high civilian casualties inherent to even limited counterforce strike makes it hard to believe that a counterforce exchange would not escalate to a full scale war. Russians and American engineers worked furiously to reduce the vulnerability of their countries’ nuclear forces. Early efforts to reduce vulnerability to a devastating counterforce first strike ranged from the practical step of hardening ICBM silos against anything but a direct nuclear strike to more dangerous schemes, like the US 1960s effort to keep B-52 bombers armed with live nuclear bombs in the air at all times to prevent a surprise Russian attack from destroying them on the ground (this scheme was abandoned after a series of accidental crashes terrifyingly resulted in the temporary loss of live nuclear bombs). However, other technological advancements more effectively reduced missile vulnerability. By the end of the 1960s ICBMs were smaller and powered by stable solid fuel rockets, meaning they could be stored fueled in very heavily armored underground silos and launched at literally minutes warning. Similarly, in the early 1960s the US and later USSR successfully deployed ballistic missiles that could be launched from a submerged submarine. While early submarine launched ballistic missiles – SLBMs – lacked the range to strike targets deep within the US or USSR, by the 1970s SLBMs were capable of the full countervalue mission. The value of a submarine launched ballistic missile were obvious – unlike land based missiles, submarines were mobile and, with the advent in the 1950s of nuclear propulsion that allowed submarines to remain deep underwater for months, increasingly undetectable. Nuclear powered submarines capable of carrying dozens of SLBMs could lurk off enemy coastlines with impunity, allowing them to launch their nuclear weapons at close range and with little warning. Unlike land-based ICBMs, a preemptive first strike had no possibility of destroying SLBMs before a reprisal could be launched. With the introduction of SLBMs, the possibility of a survivable nuclear war largely vanished. While the USSR and US were the first to introduce nuclear SLBMs, the UK, France, and China soon introduced their own missile systems, and India is expected to field one by 2015. Additionally, the Israeli Navy is believed to possess a submarine nuclear deterrence in the form of shorter range submarine-launched nuclear cruise missiles. However, unlike land-based ICBMs smaller SLBMs were never accurate enough for the counterforce mission. Both the US and USSR reserved their SLBMs for the ‘second strike’ mission that would annihilate the cities of any opponent foolish enough to launch a nuclear attack, while a large portion of ICBM forces were tasked with destroying their opponents own ICBMs. The total destruction SLBMs guaranteed to inflict on any nuclear aggressor was referred to as ‘mutually assured destruction’ – or, fittingly, MAD. The introduction of SLBMs capable of guaranteeing MAD stabilized the Cold War by definitively removing any incentive to launch a nuclear attack no matter the circumstances – for both the US and USSR, war was the worst case scenario. These three classes of weapons – nuclear bombs and cruise missiles carried by strategic aircraft, land-based ICBMs, and SLBMs – make up the nuclear deterrence ‘triad’. Not all nuclear powers maintain a full triad. Because of the high cost of developing sophisticated SLBMs and the dedicated submarines to carry them, Israel only fields a short range cruise missile-born submarine based deterrent to complement its Jericho III land-based ballistic missile. Smaller, densely settle countries like France and the UK do not choose to field ICBMs due to the land requirements and cost of large ICBM bases (the US and Russia all base their ICBM forces in the sparsely settled open prairie and steppe), preferring to base their nuclear deterrent completely on SLBMs. Similarly, the high costs and limited everyday utility of long-range strategic bomber aircraft make them unpractical for smaller nuclear powers, many which only field tactical aircraft (in common usage, fighter aircraft) capable of delivering nuclear weapons over short distances rather than dedicated strategic bombers. Because of its high cost and the limited utility of nuclear triad redundancy, today only three countries maintain a full nuclear triad: the US, Russia, and China, though the People’s Liberation Army Air Force lacks the in-air refueling infrastructure to give their Xian H-6 strategic bombers true intercontinental capability. The nuclear triad’s massive redundancy was its key advantage during the Cold War – while both the US and USSR had some incentive to strike first and destroy their rival, the triad system’s redundancy, varied delivery platforms and large number of individual weapons guaranteed that even if hit by a devastating first strike, a nuclear power would still retain the capability to retaliate. This redundancy was a key part of US nuclear doctrine: US nuclear planners required that each leg of the triad be capable of destroying the USSR independently of the other two. In this way the triad system was an important moderating influence on Cold War rivalry. However, the triad system also owed its existence to less defensible rationales. In the United States, after the development of the atomic bomb the Air Force had a monopoly on the strategic bombers needed to deliver early nuclear weapons, and later on ICBMs – a monopoly that marginalized other services. To counter this perceived deficiency, the US Navy lobbied for its own nuclear forces. In the late 1940s, before the invention of workable intercontinental ballistic missiles, US admirals vehemently argued for the construction of an extremely large class of aircraft carriers capable of launching the large strategic bombers required to carry early nuclear weapons. Air Force officials rightly perceived this as an explicit effort to end the Air Force’s monopoly on nuclear weapons, and bitterly opposed the construction of the USS United States supercarrier, which was canceled in 1949. Despite this setback, the shrinking size of nuclear weapons soon allowed the Navy to fly nuclear-armed aircraft off conventional aircraft carriers, and the Navy was later allowed to obtain its own SLBM deterrence force. While the nuclear triad’s redundancy did have its strategic advantages, its emergence was partially due to interservice bureaucratic rivalries. Competition between the US and USSR also contributed to the supremacy of the triad system. Unlike the smaller nuclear powers, both US and USSR held rival positions of leadership in the internationally community. Maintaining these bipolar leadership positions made keeping up appearances extremely important, and both the US and USSR made great efforts to match each other’s technological and social developments. When the Soviets launched the successful Sputnik satellite in 1957, the US launched a crash program to launch their own spacecraft as quickly as possible. Similarly, despite the dubious economics of building a supersonic passenger airliner, when the British and French began the high profile Concorde program (which never became anywhere near profitable) the Soviets immediately began work on their own supersonic airliner, the similarly unsuccessful Tu-144. Of course, the Cold War balance of power wasn’t altered by prestige projects like civilian space programs or glamorous supersonic airliners – the civilian technological arms race between the superpowers was only a proxy for their more serious military arms race. Just as the US and USSR strove to match each other’s civilian prestige projects, they faced an even more urgent need to counter their opponent’s military advancements. This continuous one-upmanship extended to the nuclear arms race, and contributed to the proliferation of a bewildering variety of nuclear weapons and delivery systems. While the triad system was not strictly necessary to mounting an effective nuclear deterrent, for the superpowers – unlike smaller nuclear-armed states – it was a necessity to maintaining their prestige and international image. In the aftermath of the Cold War the risk of nuclear war has declined considerable. That doesn’t mean that the US nuclear arsenal is worthless – the American nuclear force still provides the deterrence that is the ultimate guarantee of US safety. However, it is hard to argue that the size and variety of US nuclear forces is strictly necessary in today’s world. To its credit, the United States has aggressively reduced its nuclear forces since the end of the Cold War: today the US fields roughly 1,800 deployed warheads out of a total inventory of 8,500, down from a 1960 high of over 30,000. However, despite these reductions the US and Russia still maintain large numbers of nuclear weapons deployed across their triad systems. China, the only other major power to maintain a full triad, also deploys a large number of weapons, though much less than Russia or the US. – 1,152 warheads are deployed on 288 SLBMs. The US Navy’s current SLBM, the UGM-133 Trident II, carries 4 independently targeted warheads, explaining the discrepancy between the number of warheads and launch vehicles. Importantly, the Trident II’s 4 warheads is a treaty-imposed (SORT) limitation – the UGM-113 is physically capable of carrying up to 14 reentry vehicles. The US SLBM force is currently deployed on 14 Ohio class submarines. – 500 warheads on 450 LGM-30G Minuteman ICBMs. Unlike its SLBMs, the US largely refrains from fielding ICBMs carrying multiple warheads, despite the fact that the START II treaty banning MIVR missiles never entered force. The US ICBM force is currently deployed in three clusters in North Dakota, Montana, and one split between Wyoming, Colorado, and Nebraska. – Less than 150 aircraft-delivered warheads. While the US possessed roughly 300 nuclear bombs, most are in storage. Only about 60 aircraft are currently tasked with carrying these weapons, making US aircraft-delivered weapons of negligible importance in an actual full-scale nuclear war. It is important to remember that despite the limited size of the American strategic bomber fleet the US’s aircraft-delivered nuclear arsenal is still capable of killing most of humanity. – Roughly 160 SLMBs mounting roughly 576 warheads . All Russian SLBMs are modern and highly capable, and are capable of hitting targets in the continental US from Russian territorial waters. Russian SLBMs typically carry more warheads than their American counterparts: the RSM-54 Sineva (NATO reporting name SS-N-23 Skiff) carries 10 MIRVed warheads, and the RSM-56 Bulava (NATO reporting name SS-NX-32), currently under development, will carry up to 10 warheads. – Roughly 295 ICBMs mounting roughly 1,007 warheads. Russian ICBMs are advanced and capable of immediate launch in a crisis. Unlike US LGM-30 Minutemans, Russia fields mobile ICBMs capable of being transported throughout the country, making a counterforce strike against Russian ICBMs extremely difficult. Russia continues to mount the maximum number of warheads possible on their ICBMs. -At most 844 airborne nuclear weapons on roughly 76 strategic bombers. Because Russia’s currently deployed weapons fall under New START’s 1,550 limit, Russia is not treaty bound to reduce its deployed forces by 2017. -China currently fields 10 to 14 SLBMs . However, the current weapon, the JL-1, is short ranged and is not capable of reaching the continental United States from the western Pacific Ocean . A more capable SLBM, the JL-2, is close to entering service. -54 to 62 DF-3, DF-4, DF-5 ballistic missiles  that are nearing obsolesce. All of these missiles are liquid fueled, making them unable to be launched with little warning. Only the DF-5 is capable of striking targets in the continental United States. China also fields fewer than 30 modern DF-31 and longer range DF-31A missiles . -China is estimated to currently possess roughly 150 nuclear gravity bombs . People’s Liberation Army Air Force strategic aircraft are much less capable than their US or Russian counterparts, and are incapable of intercontinental operations. While the US and Russia are no longer at each other’s throats, every additional nuclear missile deployed increases the risk of a misunderstanding or accident leading to an unintended holocaust. This risk is real, and the costs of even a limited nuclear war would be truly unimaginable. While the US and Russia’s efforts to diplomatically reduce their deployed nuclear weapons are laudable, they aren’t enough. The US should take further steps to reduce its nuclear forces. Despite its troubled road through the US Senate, the New START treaty did demonstrate that there is still enthusiasm for arms reduction in the US and Russia. However, this isn’t enough. While still valuable, strategic arms treaties are an extremely conservative way to reduce the ever present threat of excessive nuclear arms. The United States should take the more dramatic step of eliminating one leg of its nuclear triad. This would be an unprecedented advance in arms control, and would uproot the stasis of gradual treaty arms reduction. In addition to reducing the size of the US nuclear arsenal, such a dramatic action would win the United States enormous international goodwill and respect. This would also fit into the US government’s idealistic aspirations – only two years ago President Obama proclaimed that “I state clearly and with conviction America’s commitment to seek the peace and security of a world without nuclear weapons.” Eliminating a leg of the US nuclear triad is a laudable contribution to this worthy and attainable goal. This argument makes sense. ICBMs are destabilizing, the counterforce mission’s dubious deterrence value makes them irrelevant to US security, and no one believes in first strike scenarios anymore anyway. Giving up American ICBMs would not decrease the US’s second strike capabilities, and would preserve America’s ability to credibly deter potential adversaries. But why limit our aspirations to only one leg of the nuclear triad? SLBMs are the obvious choice to preserve: their invulnerability and second strike capability is the basis of MAD and the nuclear peace. However, unfortunately for nuclear idealists there are also good reasons for preserving US airborne nuclear weapons. Nuclear warheads carried by strategic bomber aircraft make up only a small fraction of the US nuclear arsenal – under New START, the US fields less than 300 aircraft-launched nuclear bombs, most in storage. However, aircraft-delivered nuclear weapons offer flexibility unavailable to other delivery systems. Unlike ballistic missiles, manned bomber aircraft can be recalled or redirected, giving policymakers an extra margin of safety in a crisis. Similarly, bomber aircraft can be deployed without inadvertently starting a nuclear war. Arguably the greatest nuclear threat of the 21st century comes from small rouge nations possessing a handful of warheads like North Korea or potentially Iran, rather than great powers like Russia or China. US deterrence strategy towards these states relies on the threat of massive nuclear retaliation for destructive actions. However, ICBMs or SLBMs are not suited for this mission, because when a ballistic missile is launched it is not immediately obvious where it’s being targeted (while a missile’s target can be determined by its ballistic trajectory, this trajectory is not apparent until several minutes into the missile’s flight. A nervous observer a credible incentive to launch a retaliatory strike as soon as a potential enemy launch is detected, before the target is apparent). Even a justifiable US nuclear launch against a rouge state in a crisis (laying aside the arguable morality of any retaliatory nuclear strike) could easily be misinterpreted by China, Russia, or any other nuclear power as a preliminary strike against them, giving them enormous incentive to launch their own missiles against the US before they could be destroyed on the ground. While this scenario is unlikely, the inherent panic and confusion of any crisis scenario where the US is seriously deliberating a nuclear strike against a rogue state makes it much more likely. However, aircraft-launched weapons have much less room for misinterpretation – an aircraft’s destination is visible to anyone with the technological resources to detect it, and an nuclear airstrike’s slow speed compared to a ballistic missile make a panicked misunderstanding less likely. Given that the technology required to manufacture nuclear weapons is likely to become available to more and more small states in the next century, deterring rouge states like North Korea and Iran, rather than superpowers, is likely to be the primary mission of the US nuclear deterrence in the future. This justifies the preservation of US air-delivered nuclear weapons and strategic bombers. Just as the US will continue to rely on its SLBM force to deter advanced powers like Russia and China, the strategic nuclear bomber force will deter small nuclear-armed states. As Fred Kaplan points out, eliminating US ICBMs would not meaningfully compromise the American nuclear deterrent: while eliminating ICBMs would sacrifice much of the counterforce mission, the US would retain an iron-clad second-strike capability in the form of SLBMs and flexible nuclear response capability in deployed strategic and tactical bomber aircraft. However, as New START’s tumultuous road through the US Senate illustrates, even mild nuclear disarmament in not popular in some circles of American government. The USAF shares this opposition to nuclear cuts, especially to its ICBMs. Air Force Secretary Michael Donley emphasized this point in a recent speech before the Air Force Association, strenuously arguing against nearly all potential cuts to Air Force funding and mission and reiterating “as the U.S. nuclear arsenal gets smaller and the number and diversity of nuclear-armed powers increases, the flexibility inherent in our nuclear triad becomes even more important. We must maintain the nuclear triad.” However, like most criticism of cutting or eliminating entirely US ICBMs, this isn’t a compelling argument. Yes, the nuclear triad is more flexible than a nuclear force based on only two legs. However, unless proponents of the triad can explain how much marginal safety ICMBs contribute to the US nuclear deterrence and whether this marginal gains outweighs their costs, this isn’t a serious argument. Eliminating US ICBMs faces three main obstacles: Republican aversion to all arms reduction, domestic interservice rivalries, and likely Russian refusal to make reciprocal reductions, which is sure to dampen US enthusiasm for such a drastic disarmament. The first obstacle is perhaps the most manageable. While Republicans are sure to loudly proclaim that any reduction in US nuclear forces, much less a wholesale abandonment of venerable ICBMs, is appeasement and a gross threat to US security, the truth is that even without ICBMs the US will still enjoy a comfortable margin of nuclear security in the other legs of the triad. As noted above, the US enjoys a commanding SLBM lead over Russia. Because SLBMs are the basic of mutually assured destruction, this lead is an iron-clad guarantee of US security. Additionally, while aircraft-born nuclear weapons are the smallest leg of the US triad, the American strategic bomber force is far more capable that Russia’s. The mainstay of the Russian strategic bomber fleet – venerable Tu-95 turboprop aircraft – would likely have trouble penetrating US defenses in an open conflict, and Russia only fields 13 (as of 2011) modern and more capable Tu-160 ‘Blackjack’ aircraft. This US lead is even more pronounced over the Chinese, the only nuclear power to retain dedicated strategic bomber aircraft into the 21st century. In contrast the US dedicates 60 B-52 and B-2 aircraft to the nuclear mission, and retains highly capable B-1 Lancer aircraft which despite having their nuclear capability removed in 1995 could potentially be refitted for the nuclear strike mission. B-2 strategic bombers — whose stealth technology dramatically increases their survivability and capability — are a particularly important, and unique, US asset. The relative strength of the US strategic bomber force is an important counter to arguments that eliminating US ICBMs is dangerous. Even without the ICBM force, in combination with US SLBMs US air delivered nuclear weapons would preserve America’s capability to deliver a flexible nuclear response with strong deterrent value. Additionally, preserving the bulk of the US airborne nuclear arsenal addresses another potential barrier to unilateral ICBM disarmament: domestic interservice rivalries. Even if the US completely eliminated its ICBM force the US Air Force would still retain a nuclear capability. Though the prestige and relevance of the nuclear mission has declined precipitously since its inception during the 1940s and 1950s military organizations, like any bureaucracy, are loath to voluntarily give up power and influence. However, the preservation of the airborne nuclear strike mission would preserve some measure of nuclear relevance in the USAF, giving lawmakers a tool to allay Air Force leaders’ opposition to eliminating USAF ICBMs. Civilian leaders could also leverage Air Force concerns over budget cuts to win acceptance for reducing the USAF nuclear force. While a minor component of total USAF spending, maintaining the nuclear deterrence force is still costly, accounting for an estimated $5.2 billion in fiscal year 2012, or roughly 3% of the total Air Force budget . LGM-30 ICBM total operations and maintenance outlays estimated to increase by $19.5 million in 2012 . Given the Pentagon’s tightening fiscal horizon, freeing up funds devoted to ICBM operations for more prestigious projects could entice Air Force leaders to refrain from protesting retiring the ICBM force. The last obstacle is the highest. US domestic pressures will make it very difficult to eliminate ICBMs unless the Russians – still our principal nuclear adversaries, despite rising concern about China’s military ambitions – make matching cuts. This is understandable. Just as 1960s fears about a (ironically non-existent) “missile gap” between US and Soviet ICBM capabilities helped elect John F. Kennedy, modern Americans will be deeply wary of American disarmament that isn’t matched by the Russians. To most Americans, ICBMs are the weapons of nuclear war and it isn’t widely understood that land-based ballistic missiles are a smaller leg of the nuclear triad – in the popular consciousness, eliminating ICBMs is equivalent to abandoning America’s entire nuclear shield. If the Russians decline to make matching reductions, it will be very difficult to convince American voters that eliminating ICBMs is a rational next step in disarmament. Unfortunately, the Russians are unlikely to eliminate their own ICBMs. Russian strategic nuclear forces are much more biased towards ICBMs than America’s, where SLBM-born warheads outnumber ICBMs by more than 2 to 1. Russia fields roughly 570 SLBM-carried warheads on 160 missiles, compared to approximately 1,000 warheads on 290 ICBMs. This means that the Russian military would sacrifice a much larger portion of its total nuclear forces by eliminating ICBMs. Similarly, the US fields more ballistic missile submarines than the Russians: while the US SLBM force is currently carried on 14 Ohio class submarines, the Russian fleet currently operates only 5 Delta III and 7 Delta IV class ballistic missile submarines. Exacerbating this imbalance, the Delta classes are nearing retirement, and are scheduled to be replaced by only 8 of the upcoming Borei class (one of which has already entered service), which is admittedly much more advanced than the Deltas it is slated to replace. This imbalance is partially due to historical reasons – as a continental power, the USSR never invested as much in its navy as the US did – but is also due to chronically strained Russian defense funding. Ballistic missile submarines are extremely expensive. The upcoming Russian Borei class has a unit cost of $890 million, and the US Ohio class $2 billion. SLBMs are also more expensive than their simpler land-based cousins. The unit cost the American LGM-30 Minuteman is $7 million, while the cost of the UGM-133 Trident II is $30.9 million. Russian missiles show a similar price difference. This price difference shouldn’t be surprising: SLBMs are launched from underwater and must be compact enough to fit within the hull of a submarine, making them that much more difficult to engineer. Even today, SLBMs are difficult to produce: Russia’s “troubled” RSM-56 Bulava, currently under development, has failed 6 of its 16 flight tests. This isn’t a knock against Russian engineering prowess: it’s a fairly typical record for ambitious missile development programs. Eliminating their ICBM force and maintain nuclear parity with the US at New START levels would require the Russians to field roughly 120 SLBMs mounting 540 individual warheads. Russia is unlikely to commit to such an expensive restructuring of its nuclear forces. Of course, the commitment problem caused by the US/Russian SLBM imbalance could be addressed by a future arms limitation treaty that limited strategic arms to fewer than 600 warheads, bringing US SLBMs in line with Russian arsenals. This isn’t hopelessly optimistic – it’s worth remembering that the 1,550 warhead limit mandated by New START is a dramatic decline from the 6,000 limit of the 1991 START I treaty, so further reductions are possible in the future. Unfortunately, there’s no easy way around the Russian’s understandable reluctance to reorient their strategic nuclear forces – there’s simply no way US activists can convenience Russian leaders to spend billions dramatically increasing the size of their SLBM force in exchange for retiring the ICBM Strategic Rocket Forces. However, activists do have control over the domestic US reaction to understandable Russian intransigence. Republican hawks and many security-minded Democrats are sure to insist that the US will not deactivate its ICBM force if the Russians are unwilling to do the same. However, a bilateral disarmament is not strictly necessary. It’s difficult to argue that the United States would be less secure if it gave up its ICBMs and the Russians and Chinese did not. By eliminating ICBMs the US would give up counterforce capability, but this really wouldn’t change the nuclear equilibrium between the US and Russia. Russia would have a monopoly on the counterforce capability to destroy US land-based missiles, but the US wouldn’t have vulnerable ICBMs in the first place. Both powers would retain a second strike capability in SLBMs and hardened Russian ICBMs, and a limited strategic bomber second strike capability. Eliminating US ICBM forces would lessen the change of an accidental war and reduce US military spending while preserving nuclear weapons’ deterrence value. Unfortunately, as New START demonstrated even moderate and objectively conventional arms control measures have trouble avoiding increasingly knee-jerk Republican obstructionism. However, that’s no reason not to press ahead. There’s a strong argument for unilaterally eliminated US ICBMs. Federation of American Scientists/Natural Resources Defense Council, “Simulated US and Chinese Nuclear Strikes”, 184. Bulletin of the Atomic Scientists, “Russian Nuclear Forces 2011”, 68. The Federation of American Scientists and the Natural Resources Defense Council. “Chinese Nuclear Forces and US Nuclear War Planning”, 38. Naval War College, “China’s Nuclear Force Modernization” , 16. Naval War College, “China’s Nuclear Force Modernization” , 15. US Air Force Air and Space Intelligence Center, “Ballistic and Cruise Missile Threats 2009”, 21. Department of the Air Force, “FY 2012 Budget Overview”, 34. Department of the Air Force. “Fiscal Year (FY) 2012 Budget Estimates Operations and Maintenance, Vol. I”, 36. An earlier version of this article first appeared in ClickRally Magazine. This post has been edited to correct several numerical errors (April, 2014). I believe in retaining the nuclear triad. I would restructure the nuclear forces as follows: 300 icbms, 240 slbms (on 10 subs), 18 B-2 bombers. I would place W87 warheads on the icbms (300), 5 W88 warheads on each slbm (1,200), this would field 1,500 strategic warheads. The B-2 would carry B83 gravity bombs only (300). The B61 gravity bomb (500) would be fitted for only tactical fighter aircraft. The B-52H would be converted to conventional only. The AGM-86B would be converted to conventional only. 150 icbms would sit in silos without warheads. 450 W78 warheads would be kept in storage to upload on icbms in times where the treaty is abandoned. 720 W88 warheads would be kept in storage to upload on slbms if needed. 2 Ohio subs would be converted to tactical Trident II SSGNs. This structure would field the most robust force while also reducing delivery vehicles that would be better utilized as conventional only.